Chronic wounds are characterised by compromised and dysfunctional extra-cellular matrix (ECM). The ECM provides sites for attachment of skin cells. These attachment sites are critical for cellular functions that are important for healing, including proliferation, migration and survival of skin cells, all of which are dependent on cell adhesion. The microenvironment of chronic wounds is one in which the ECM is degraded and thus cell attachment may not be possible. Effective clinical treatment of this situation requires correction of the cellular microenvironment to restore healing. In chronic wounds, the rationale for the use of a scaffold is to provide a biomimetic ECM replacement that when placed in the wound bed, offers a temporary support onto which cells can attach, migrate and proliferate in an organized manner, thus leading to tissue regeneration and ultimately wound closure. VitroGro® ECM binds collagen in skin, and importantly is adsorbed onto the wound bed and not absorbed into the underlying tissues. 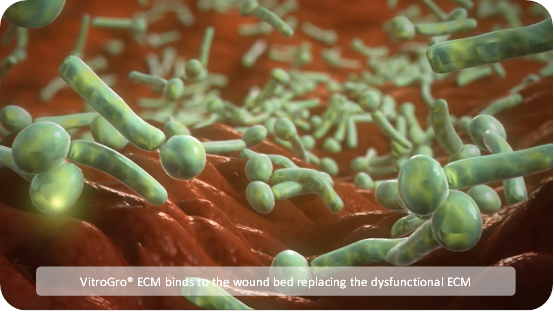 As a consequence the action of VitroGro® ECM is localised to the wound bed. 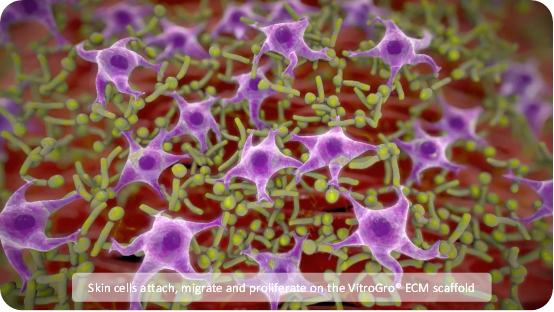 The primary action of VitroGro® ECM is to act as a scaffold, which enables cell attachment. This attachment is a critical mechanism for enabling cell proliferation and migration. Based upon in vitro data, the majority of the biological activity is attributable to the Vitronectin component. An ancillary action occurs by virtue of the IGF-1 component, which promotes cell migration and proliferation. These cell functions are important for wound healing. The mode of action of VitroGro® ECM has been characterised in conjunction with our major research partner, QUT and is published in Shooter et.al. . Additional data is currently being prepared for publication with Queensland University of Technology (QUT). Shooter GK et.al. A pre-clinical functional assessment of an acellular scaffold intended for the treatment of hard-to-heal wounds. Int Wound J 2013.